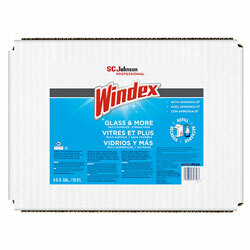 Time-saving, no-mess economical bag-in-box dispenser of ready-to-use glass cleaner for refilling plastic spray bottles. Built-in handles and easy-to-pour dispenser spigot. No-phosphorous formula. Application: All-Purpose; Applicable Material: Glass; Hard Surfaces; Chemical Compound: Ammonia; Dirt Types: Dust; Soil. Using a 5-gal BIB instead of a 5-gal pail helps reduce 2.74 pounds of plastics (i.e., 0.31 versus 3.05 pounds). Glass Cleaners from Windex! 1217 In Stock today.